I'm clearly on a sweater kick, and this pic taken yesterday of Parisian designerJeanne Damas in a Miu Miu oversized cardigan is further fueling my obsessive flames. I. MUST. HAVE. IT! (The cardi can also be found here and in light blue, here.) P.S. How good is this whole outfit? Just goes to show the power of a good shoe (her boots can be found here) and an investment statement bag. 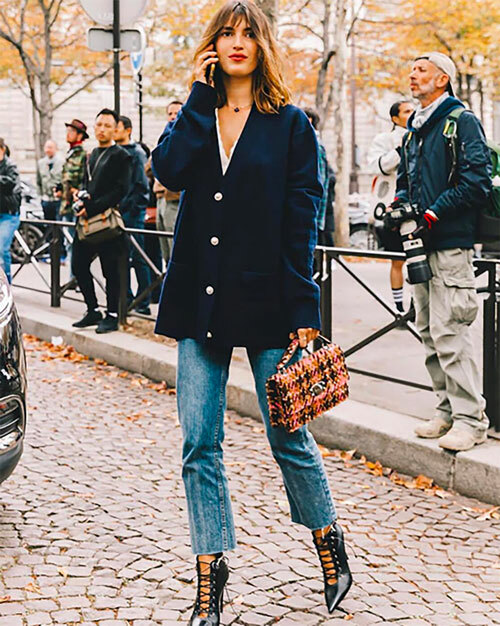 Jeanne's bag is also by Miu Miu, but others like this Gucci, this Isabel Marant, this vintage Dior and this vintage Chanel, would also knock it out of the park!